Brian Burke, president and general manager of the Toronto Maple Leafs, announced Wednesday evening that the team has signed unrestricted free agent defenceman Brett Lebda to a two year contract. Lebda, 28, appeared in 62 playoff games for the Detroit Red Wings over the past five postseasons. He dressed for 19 and 23 playoff games in 2008 and 2009, respectively, as the Red Wings advanced to the Stanley Cup Final in both seasons. During Detroit’s successful run to the Stanley Cup Championship in 2008, Lebda played in 19 playoff games and averaged 12:33 of ice time. Lebda scored his first NHL goal in his first NHL game on October 5, 2005 versus Patrick Lalime of the St. Louis Blues. The Buffalo Grove, Illinois native enjoyed a standout career at the University of Notre Dame from 2000 to 2004. During that time, he made the CCHA All-Rookie Team (2001) and the CCHA Second All-Star Team (2004). In 152 games with the Fighting Irish, Lebda scored 26 goals and added 59 assists for 85 points. 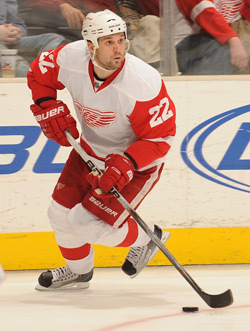 Undrafted, Lebda originally signed as a free agent with Detroit on July 21, 2004.